Wenzl Hause seems to have been the first bass player to talk about the use of the bass in recitatives, at the end of Volume 1 of his Complete Method. But he was by no means the only one: Franz Simandl’s New Method, first published in 1874, also has a whole volume dedicated to this practice (Part 1, Volume 5). Simandl basically says the same things that Hause does – one particular thing they both emphasize is for bass players not to hold out long notes in secco recitatives. 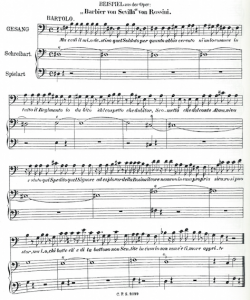 In this kind of recitatives, which usually occur in Italian operas, the notes are not held out to their length, even when several of them are connected by a tie, but are only given with a short, strong bow stroke at every change of harmony. So, in the late 19th century – again, Simandl’s method was first published in 1874 – this way of playing recitatives obviously not only reinforced the notion of the bass being totally involved (why would this be in a bass method, otherwise? ), but also showed that in certain situations, what we today consider to be baroque performance practice was still in effect for operas written in the first half of the 19th century and performed long after. What is keeping these works from being performed today the way they were when they were written and first performed, other than not knowing and not caring about correct performance practice? And when will we finally see and hear this correct way of performing being done again?